Slow release pelletised garden food that is ideal for flowers, shrubs, natives & preplanting of vegetables. It helps hold moisture in the soil, reducing watering, and activates beneficial soil micro-organisms to improve soil structure. 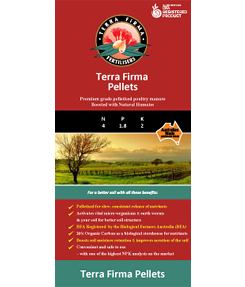 Unlike raw manure, Terra Firma Pellets have a guaranteed analysis, will not burn plants, is easy to spread and store, is easy to transport and has no weed seeds or pathogens. Home Garden 150 Ð 300g/square metre in the vegetable garden and around established shrubs. Suitable for use on natives at lower rates particularly near plants of the Proteacea Family. Commercial Vegetables and Vine Fruit Production 500 Ð 2500kg/Ha as a pre-plant application depending on the type and quantity of other soil inputs. Tree Crops 250 Ð 500kg/Ha depending on age of trees. Apply under trees with more around the drip line if possible generally in Spring and or Autumn. Pasture 200 Ð 250kg/Ha after grazing in Winter. Over Winter the pellets will incorporate in the top soil and help initiate greater biological activity in growth in Spring.